Sepor’s Vacuum Drum Filter Stations feature either a 3′ diameter by 1′ face length, or a 3′ diameter by 3′ face length vacuum drum precoat filter. The filter stations are optionally available with a scraper drum filter. 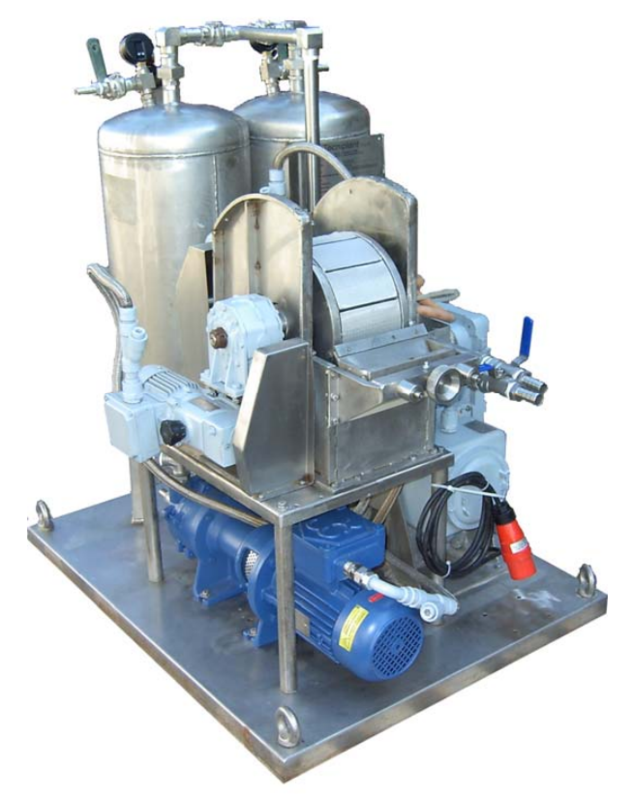 The filter stations are completely assembled and include vacuum pump, filtrate receiver, filtrate pump, feed holding tank with mixer, all internal piping, valves, completely wired control panel all mounted in a structural steel skid. Materials of construction (wetted parts) may be mild steel, stainless steel or polypropylene. Scraper Vacuum Drum Filters are typically used to dewater slurries of up to a moderate difficulty in filtering, such as high solids slurries where the solids content ranges from 15% to 50% solids. The Precoat Vacuum Drum Filters can dewater low solids slurries, up to 10% solids, of difficult to filter solids, slimy or even oily sludges. Advantages of our precoat vacuum drum filters include high capacity due to high speeds, drier cake due to low submergence, thinner precoat cuts due to superior knife advance system, low maintenance, easy to precoat due to high speed, low power requirements, cake expansion and shrinkage is limited because of constant vacuum and higher filtration rate per square foot of filter area.